Roseau, Dominica – January 29, 2008…………. Progress is being reported on the Melville Hall Airport Upgrade Project with arriving passengers now being received at the extension of the terminal building now under construction. On Monday, January 28, 2008, Minister for Ports, Hon. 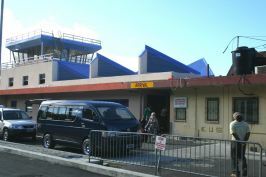 Charles Savarin invited the media to the Melville Hall Airport to witness for themselves arriving passengers now going through customs and immigration at the extension of the old terminal building. The transfer of operations of customs and immigration took effect on Sunday, January 20, 2008. Moving customs and immigration to the new section now allows the contractors access to the section previously used to process customs and immigration so as to continue with the renovation programme with the intention of having a single refurbished terminal building upon completion. 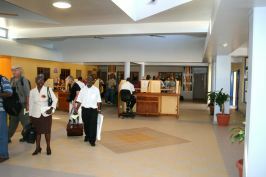 The renovation and extension of the terminal building is part of Package One of the Melville Hall Airport Upgrade Project. Package One comprises the renovation and extension of the terminal building, car park and access road improvement and the construction of a river wall, a new cargo shed and a maintenance building. The car park and cargo shed have been built. The works are being undertaken by Emile Gardakkhan et Fils Ltd.
Package Two comprises runway and apron resurfacing and marking, navigation and lighting equipment installation, drainage and fencing. This is to be undertaken by COLAS at an estimated contract sum of 8.8 million Euro (36 million ECD). Package Three (Earth Movement and River Diversion) comprises excavation and earth movement and river diversion to create RESA(Reserve End Safety Area) to the West, while Package Four comprises land reclamation, road realignment and coastal defence works to create RESA to the East. These works are being undertaken by the Venezuelan Army Corps of Engineers at an estimated value of US$10 million (27 million ECD). Package Five comprises of navigational aids; meteorological equipment and fire and rescue equipment. This is to be undertaken with EU funds under SFA2004.